The Workbook is the main object exposed by the libxlsxwriter library. It represents the entire spreadsheet as you see it in Excel and internally it represents the Excel file as it is written on disk. filename The name of the new Excel file to create. When specifying a filename it is recommended that you use an .xlsx extension or Excel will generate a warning when opening the file. anatomy.c, array_formula.c, autofilter.c, dates_and_times01.c, dates_and_times02.c, dates_and_times03.c, defined_name.c, demo.c, doc_custom_properties.c, doc_properties.c, format_font.c, format_num_format.c, headers_footers.c, hello.c, hide_row_col.c, hide_sheet.c, hyperlinks.c, image_buffer.c, images.c, merge_range.c, merge_rich_string.c, outline.c, outline_collapsed.c, panes.c, rich_strings.c, tab_colors.c, tutorial1.c, tutorial2.c, tutorial3.c, utf8.c, and worksheet_protection.c. This function is the same as the workbook_new() constructor but allows additional options to be set. constant_memory: Reduces the amount of data stored in memory so that large files can be written efficiently. In this mode a row of data is written and then discarded when a cell in a new row is added via one of the worksheet_write_*() functions. Therefore, once this option is active, data should be written in sequential row order. For this reason the worksheet_merge_range() doesn't work in this mode. See also Constant Memory Mode. See Working with Memory and Performance for more details. workbook Pointer to a lxw_workbook instance. sheetname Optional worksheet name, defaults to Sheet1, etc. The workbook_add_worksheet() function adds a new worksheet to a workbook. At least one worksheet should be added to a new workbook: The Worksheet object is used to write data and configure a worksheet in the workbook. / \ [ ] : * ? In addition, you cannot use the same, case insensitive, sheetname for more than one worksheet, or chartsheet. anatomy.c, array_formula.c, autofilter.c, chart.c, chart_area.c, chart_bar.c, chart_clustered.c, chart_column.c, chart_data_table.c, chart_data_tools.c, chart_doughnut.c, chart_fonts.c, chart_line.c, chart_pattern.c, chart_pie.c, chart_radar.c, chart_scatter.c, chart_styles.c, chartsheet.c, constant_memory.c, data_validate.c, dates_and_times01.c, dates_and_times02.c, dates_and_times03.c, defined_name.c, demo.c, doc_custom_properties.c, doc_properties.c, format_font.c, format_num_format.c, headers_footers.c, hello.c, hide_row_col.c, hide_sheet.c, hyperlinks.c, image_buffer.c, images.c, merge_range.c, merge_rich_string.c, outline.c, outline_collapsed.c, panes.c, rich_strings.c, tab_colors.c, tutorial1.c, tutorial2.c, tutorial3.c, utf8.c, and worksheet_protection.c. 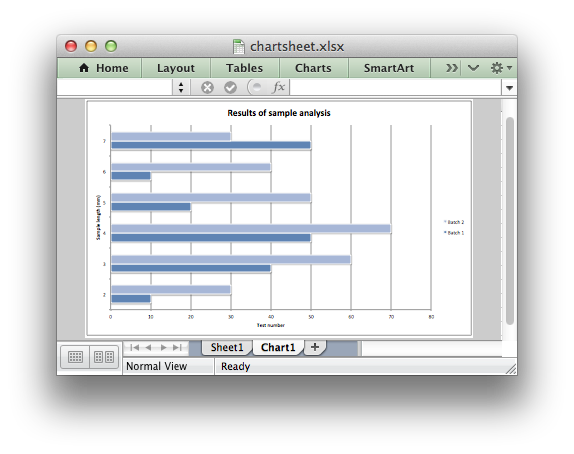 sheetname Optional chartsheet name, defaults to Chart1, etc. The workbook_add_chartsheet() function adds a new chartsheet to a workbook. The Chartsheet object is like a worksheet except it displays a chart instead of cell data. In addition, you cannot use the same, case insensitive, sheetname for more than one chartsheet, or worksheet. At least one worksheet should be added to a new workbook when creating a chartsheet in order to provide data for the chart. 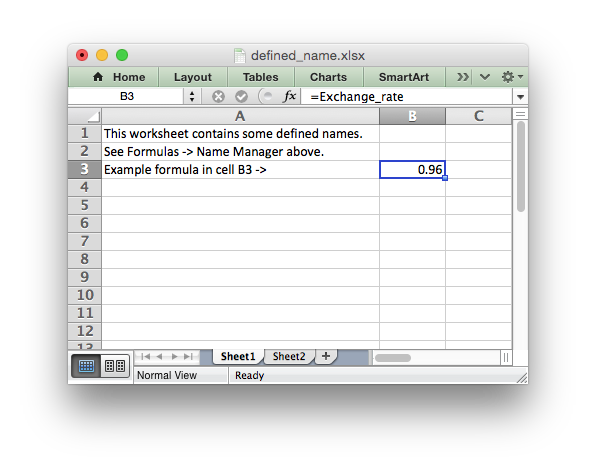 The Worksheet object is used to write data and configure a worksheet in the workbook. The workbook_add_format() function can be used to create new Format objects which are used to apply formatting to a cell. // Set some of the format properties. // Use the format to change the text format in a cell. See the Format object and Working with Formats sections for more details about Format properties and how to set them. anatomy.c, chart_area.c, chart_bar.c, chart_clustered.c, chart_column.c, chart_data_table.c, chart_data_tools.c, chart_doughnut.c, chart_line.c, chart_pattern.c, chart_pie.c, chart_radar.c, chart_scatter.c, chartsheet.c, data_validate.c, dates_and_times01.c, dates_and_times02.c, dates_and_times03.c, demo.c, format_font.c, format_num_format.c, hyperlinks.c, merge_range.c, merge_rich_string.c, outline.c, outline_collapsed.c, panes.c, rich_strings.c, tutorial2.c, tutorial3.c, and worksheet_protection.c. chart_type The type of chart to be created. See lxw_chart_type. // Create a chart object. // Add data series to the chart. LXW_CHART_AREA_STACKED Area chart - stacked. LXW_CHART_AREA_STACKED_PERCENT Area chart - percentage stacked. LXW_CHART_BAR_STACKED Bar chart - stacked. LXW_CHART_BAR_STACKED_PERCENT Bar chart - percentage stacked. LXW_CHART_COLUMN_STACKED Column chart - stacked. LXW_CHART_COLUMN_STACKED_PERCENT Column chart - percentage stacked. LXW_CHART_SCATTER_STRAIGHT Scatter chart - straight. LXW_CHART_SCATTER_STRAIGHT_WITH_MARKERS Scatter chart - straight with markers. LXW_CHART_SCATTER_SMOOTH Scatter chart - smooth. LXW_CHART_SCATTER_SMOOTH_WITH_MARKERS Scatter chart - smooth with markers. LXW_CHART_RADAR_WITH_MARKERS Radar chart - with markers. LXW_CHART_RADAR_FILLED Radar chart - filled. chart.c, chart_area.c, chart_bar.c, chart_clustered.c, chart_column.c, chart_data_table.c, chart_data_tools.c, chart_doughnut.c, chart_fonts.c, chart_line.c, chart_pattern.c, chart_pie.c, chart_radar.c, chart_scatter.c, chart_styles.c, and chartsheet.c. The workbook_close() function closes a Workbook object, writes the Excel file to disk, frees any memory allocated internally to the Workbook and frees the object itself. properties Document properties to set. The workbook_set_properties function can be used to set the document properties of the Excel file created by libxlsxwriter. These properties are visible when you use the Office Button -> Prepare -> Properties option in Excel and are also available to external applications that read or index windows files. // Create a properties structure and set some of the fields. // Set the properties in the workbook. name The name of the custom property. value The value of the custom property. 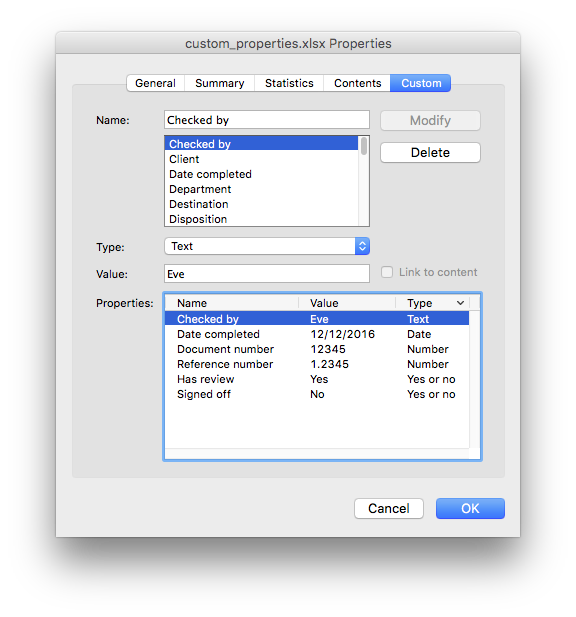 The workbook_set_custom_property_string() function can be used to set one or more custom document text properties not covered by the standard properties in the workbook_set_properties() function above. Note: the name and value parameters are limited to 255 characters by Excel. Set a custom document number property. See workbook_set_custom_property_string() above for details. 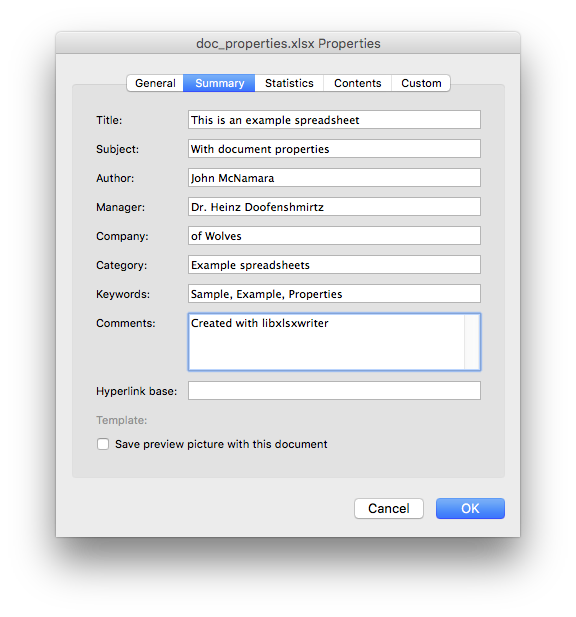 Set a custom document boolean property. See workbook_set_custom_property_string() above for details. datetime The value of the custom property. Set a custom date or time number property. See workbook_set_custom_property_string() above for details. formula The cell or range that the defined name refers to. 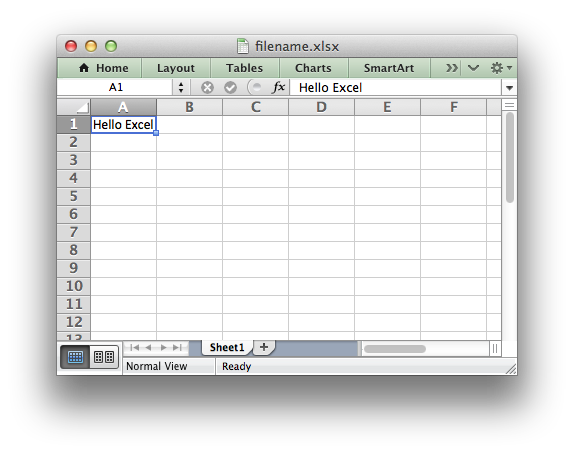 The rules for names in Excel are explained in the Microsoft Office documentation. sheetname Sheet name to validate. The name is less than or equal to 31 UTF-8 characters. The name isn't already in use. This function is called by workbook_add_worksheet() and workbook_add_chartsheet() but it can be explicitly called by the user beforehand to ensure that the sheet name is valid. Optional parameters when creating a new Workbook object via workbook_new_opt(). tmpdir: libxlsxwriter stores workbook data in temporary files prior to assembling the final XLSX file. The temporary files are created in the system's temp directory. If the default temporary directory isn't accessible to your application, or doesn't contain enough space, you can specify an alternative location using the tmpdir option. The members of the lxw_workbook struct aren't modified directly. Instead the workbook properties are set by calling the functions shown in workbook.h. lxw_worksheet *worksheet; // Generic worksheet pointer. // Worksheet objects used in the program. // Iterate over the 3 worksheets and perform the same operation on each.